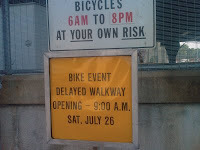 Huh, so the bridge walkway is closed on Saturday morning for a bike event? We'll try to get a response from DRPA and post it here. Update: The event is the Irish Pub Tour De Shore. 700 Bicyclists will be using the bridge walkway (apparently not enough for the DRPA to close down a lane of traffic).